So you want a cool and advanced animation effect on your Windows 8 Start Screen. Their is a registry trick which will help you achieve the animation effect. You can also use a small software which will do it in a easy way. You must be familiar with new Metro UI start screen present in Windows 8. It is actually a replacement of the old but good start menu present in Windows 7 and older version. The new start screen shows tiles of installed apps and programs, it also shows live previews. There are many apps present Windows 8 Store which you can download for free. In this post I will tell you how to enable secret animation in Windows 8 start screen. You might have felt some sort of smooth animation effect on the start screen while booting/starting into your Windows 8. But it is shown only once (while starting/booting Windows). If you want the animation effect to be shown every time you click on the Start Screen than their is a registry tweak which will make the animation to be shown every time you go into the Windows 8 Start Screen. You can also change or customize the animation of the Start Screen such as tile offset. Now take a look at the GIF image of animated Start Screen given below. If you want to enable this cool animation on your Windows 8 PC than follow the following steps. 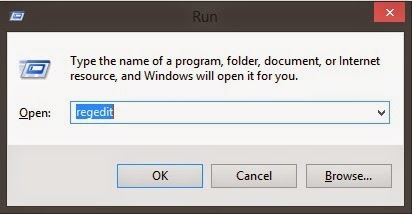 Press "Windows+R" key to open the Run. Now type regedit and than click enter. After clicking enter Registry Editor will be launched. Now navigate to HKEY_CURRENT_USER > Software > Microsoft > Windows > CurrentVersion > ImmersiveShell > Grid. Now in the right hand side you'll see many DWORD. 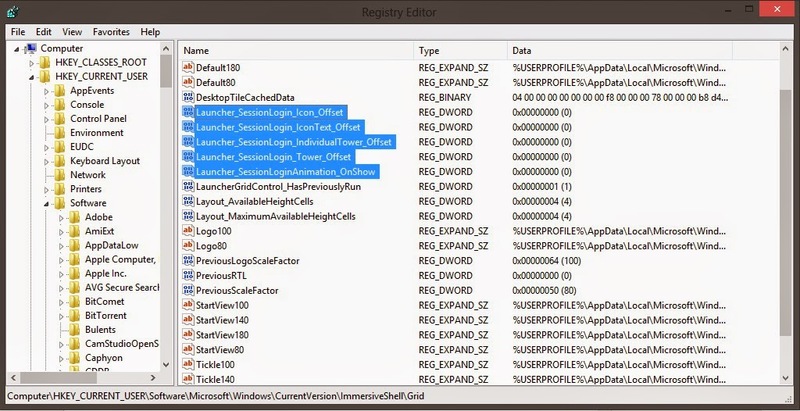 Now double click on DWORD that is named Launcher_SessionLoginAnimation_OnShow and change it's value data to 1. By changing it's value to 1 you're enabling the animation to be shown every time you click on Start Screen. Now you will like to add some cool animation effect on your Windows 8 screen. Modify the following DOWRDs and apply some cool animation on your start screen. Launcher_SessionLogin_Icon_Offset: You can modify this DWORD by double clicking it. It will apply offset to the user account picture present in Start Screen. You can set it's value data up to 1000. Launcher_SessionLogin_IconText_Offset: You can modify this DWORD to apply offset to user account name which is shown at the Start Screen. Set it's value up-to 2000. 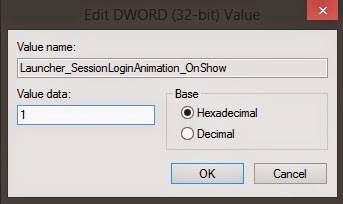 Launcher_SessionLogin_IndividualTower_Offset: You can change the value of this DWORD to control the "far" left position of Start Screen from where the Tiles will fly during animation. You can set it's value data up to 1000. Launcher_SessionLogin_Tower_Offset: You can modify this DWORD to contrrol the right position of the Tiles from where it will slide from right to it's original position. You can set it's value data up to 100. Keeping tweaking the value of the above DWORDs until you find the animation which you like. If you don't like the animation than you can change the value data of the above given DWORDs back to 0 (Zero). If you want the animation to be shown only while startup of Windows 8 than you can change the value of Launcher_SessionLoginAnimation_OnShow to Zero. And if you want the animation to be shown every time you click on start screen than set the value to 1. That's All! 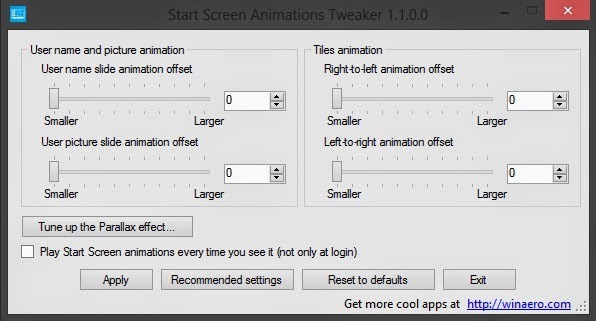 If you're still facing problem in customizing the Start Screen of Windows 8 than you can use a software named Start Screen Animation Tweaker. It comes with an option of recommended settings which automatically apply the optimal values. And if you don't like the animation effect reset it's value to default. You can download the software to customize Start Screen from here. That's All for today. Enjoy the trick.